Blacksmith's use beeswax everyday either for quenching tools at the anvil or to provide a finish on the metal work piece. Wax finishes leave a deep, lustrous glow to ironwork. They can be used for exterior and interior work. Our wax comes directly from a Beekeeper. Just rub it on metal to finish off your work or use it for a gentle quench for your punches. Generally, smiths blend equal parts of paste wax, linseed oil, and turpentine. A smaller volume of bees wax is then added. Some smiths prefer raw linseed oil to the boiled kind because it doesn't have drying chemicals in it. Some smiths mix bees wax with linseed oil and then use paste wax in the final buffing. 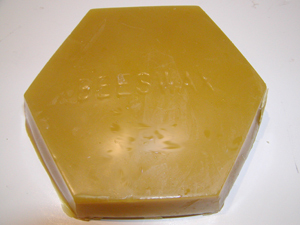 Beeswax can be used by itself. In fact, European smiths used it for centuries by simply melting the wax onto the workpiece while it was still warm. Unlike other waxes, bees wax is non-toxic and, therefore, can be used on cutlery and utensils. Nearly all candles are made with paraffin. Do not confuse this wax with bees wax. For interior use, wax finishes hold up a long time and will only need an occasional buffing. Depending on humidity and precipitation, outdoor ironwork will need to be inspected at least annually. Rusty areas can be buffed clean with steel wool and then re-waxed. For best results, ironwork should be warm (can hold in your hand) when applying the wax finish.